In this article, we will explain the process of DNS caching and DNS propagation. Basically, the DNS Servers can take a bit long to propagate the information due to intermediary networks caching procedures. Every network device on the web makes use of an IP address to route your request to the site you’re trying to connect. This is similar to someone asking to the DNS server what is the IP address of a certain domain. Then, the DNS server answers this question, with the corresponding IP address. Whenever you type a URL and hit enter a request is made for a particular website, which is routed to a DNS resolver. The ISP (Internet service providers) manages this process. May it be a cable internet provider, a DSL broadband provider, or a corporate network. The DNS resolver for the ISP forwards the request for a particular website to a DNS root name server. And once the DNS server holding the IP address for the requested website is found, it will answer with the corresponding IP address. Further, this IP address will be provided to your browser via your ISP. Sometimes your ISP can’t find the IP address information locally. In this case, it forwards the query to other DNS servers in the world. The DNS servers will “talk” between them, in order to fetch the IP address information of a domain. DNS cache (also known as DNS resolver cache) refers to a process of storing data temporarily about the previous DNS lookups on the computer’s operating system or browser. The DNS cache maintains a record (IP address) of all recently viewed websites and domains. Maintaining a cached copy of DNS lookups speeds up the process of data retrieval. Speeds up IP address resolution as well, by avoiding the need to go through the complete process of DNS lookup again. How long do the ISP’s DNS servers fetch new information about domain name changes? Whenever you update or change the nameservers for a domain, it is likely to take 24-48 hours for the change to come into effect. This happens because all the ISP (Internet service provider) nodes across the world need to update their records oftenly. They will fetch the new DNS information of your domain as well. This stipulated time period that is required for updation of new DNS/IP information is known as DNS propagation. However, it has come to notice that, due to tremenduous growth in technologies and speeding up of operational tasks the DNS propagation time has been reduced by significant amounts. The above proposed time is ideal but in many cases, it may differ according to situations. Why isn’t DNS Propagation immediate? 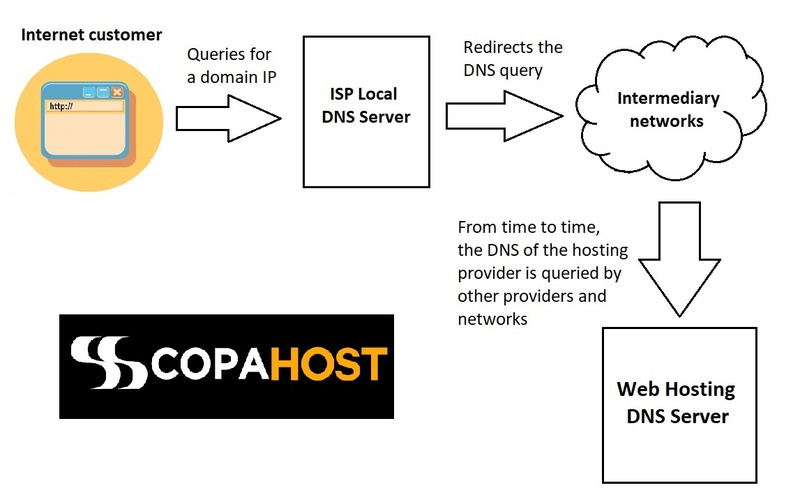 The intermediary providers must update their DNS caches from time to time. They have to keep caches, in order not to overload the internet. The internet providers’ interconnection speeds have grown substantially over the last years. Consequently, DNS caching time has been reducing. In the middle ’90s, a domain name could take up to 3 days to propagate the DNS changes. Nowadays, we can see a DNS propagation in a few hours only. Firstly, DNS propagation may take from a while to several hours to complete. It’s becoming faster and faster over time. Finally, you can use Dnschecker.com to check for the DNS Propagation status. It’s a nice tool that will help you to check the current status about DNS propagation around the world.